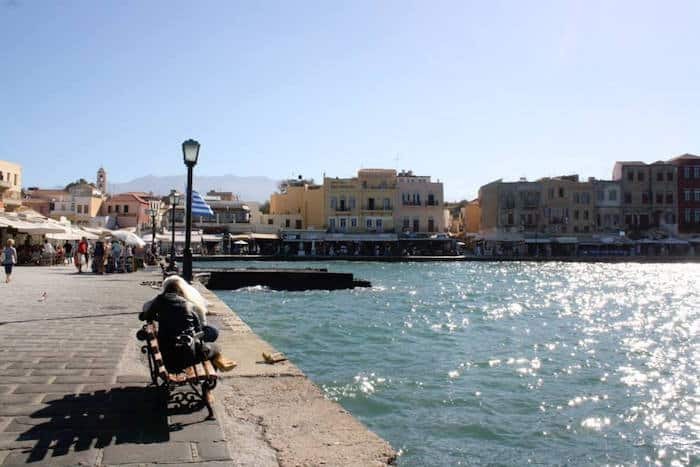 3 Things to Do in Chania, Crete You Shouldn’t Miss! Crete is one of the 6,000+ islands that make up Greece. It is the largest and most populated island and is 160 miles long from west to east. Along with having a varied coastline the interior of the island is made up of three different mountain ranges. I visited Chania on the western side of the island but used a rental car to get around and experience a little more of the island. My visit happened in October, so off of the peak tourist season (which I highly recommend). 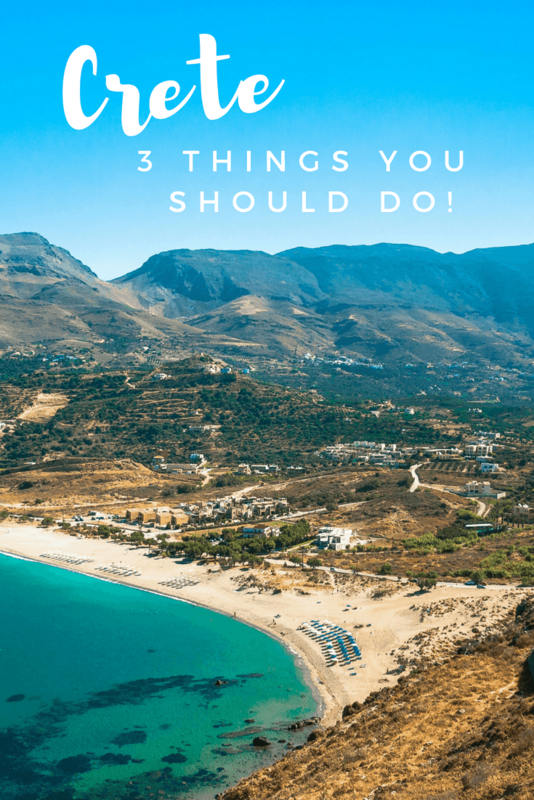 You can visit Crete for the great beaches, good food or deep history – if you’re looking for things to do in Crete, there’s really something for everyone here! 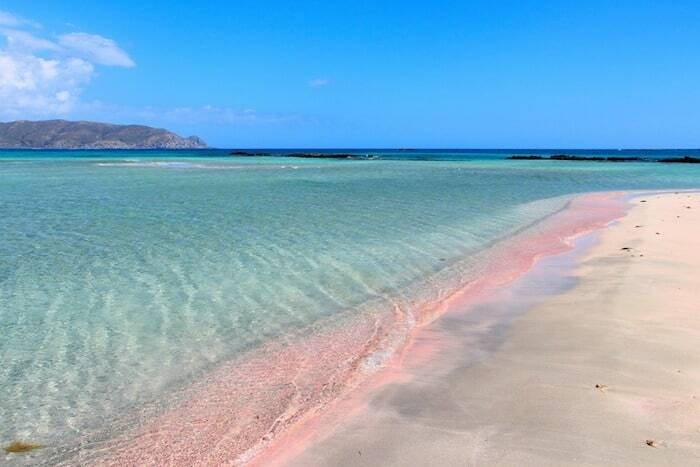 This beach is by far the most beautiful beach I have ever seen. I wasn’t sure anything could rival some ofthe Caribbean beaches I have been to. The water is a clear blue and the beach is very clean. I loved the straw covered umbrellas doting the sand. But, when I went in October one thing was missing. We thought maybe, just maybe we were in the wrong place. Or, the pictures we had seen were photoshopped. We found a waiter from a snack shop nearby and told him we were looking for the pink beach, and he told us we were in the right spot but…..
There’s only pink sand at the beginning of the season! He told us where there might be a little bit left, but that the color came from coral in deeper water and washed up in the spring. Depending on the time of year you visit, the pink will be either very brilliant or faded. The bright pink color comes in May and fades through the summer. You can easily wade in the water, checking out the fish that swim around. The best part of this beach, and why I think it’s ideal for families with children is how shallow the water is for such a long distance. There are sandbars where you can walk across and further out. We were able to go really quite far and the water only reached our knees. There are several natural rock outcrop in the water. The water here is about 1 meter (3 feet) deep and while some of the rocks are a little craggy I kept thinking my 10 year old would spend all day here with some goggles looking at the different fish, shells and rocks swimming in the area. Visiting during the summer months, especially August, I can see that this beach would be very crowded however May and early June as well as September and October would be a much better bet to enjoy the beach and not feel overcrowded. Food is a really important part of travel for me and when you’re in a place that has such a great culinary heritage it only makes sense to take advantage! I took a walking food tour in the old town of Chania with George who took us around the city to taste the traditional foods of Crete. We first stopped at a coffee shop. (where we didn’t actually taste anything, just looked around) It was a little odd and I couldn’t quite figure out why we were there. We then went to a coffee shop where we could taste Greek coffee or a traditional mountain tea along with tasty sweets. The cookies we tasted are called amigdalas, and are an almond cookie that reminded me a little of macaroons. I seriously loved all of the stuffed pastries in Crete. I ate many, many types and there weren’t any I disliked. We ate some pastries that are known as kalitsounia (little lanterns) and can be slightly sweet. They’re made with cheese and I really enjoyed them, especially a little warm. Another version is made with horta, a wild green that grows in the mountains of Greece. They eat a lot of it and it reminded me a of a mix of arugula (rocket) and spinach. In this bakery they also had rusk, the traditional Crete bread. They’re hard, sometimes made with barley flour or chickpea flour. This bread was twice baked and would last longer than soft baked bread. From here we also went to a spice shop and a cheese shop where we had a few other samples. Next up was olive oil. Olive oil is huge in Crete. It’s the cornerstone of the traditional diet. 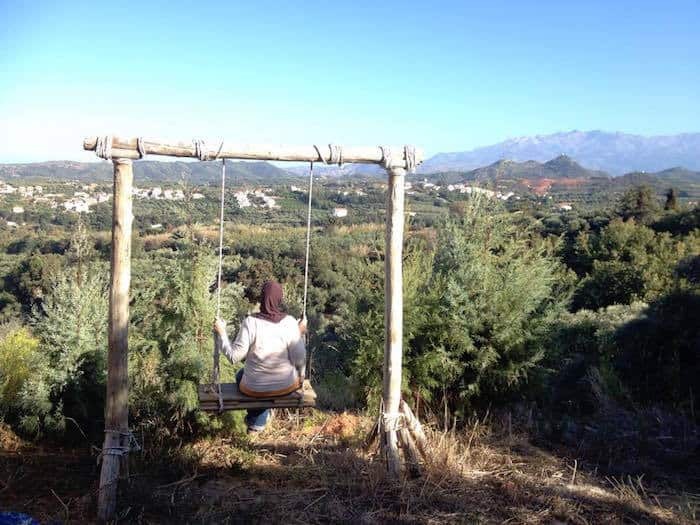 Many people have their own olive orchards and if they don’t they have family members who do. Every year they harvest and press their own oil, hardly ever buying oil off the shelves. We tried several different types of oil, on a spoon (that was a little odd), and my favorite a balsamic vinegar with grape syrup. I could have sipped the entire bottle. Our last stop was a winery for a small tasting, that I sat out. However I did get to try a submarine. No, not the sandwich (or the boat), this is a sweet on the islands. A very thick, sweet candy is put on a spoon and dipped into a cold glass of water. I tried the lavender flavor. You dip and lick the sweet. Honestly sipping the cold, sweet lavender water afterwards was my favorite part. 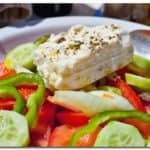 There are also several options for cooking classes in Crete. I did one with a Cretan woman named Maria. She warmly welcomed us into her kitchen in an old neighborhood of Chania, near the ocean. Perfect! This was a hands on class, we all took turns and some portions Maria explained but did herself. 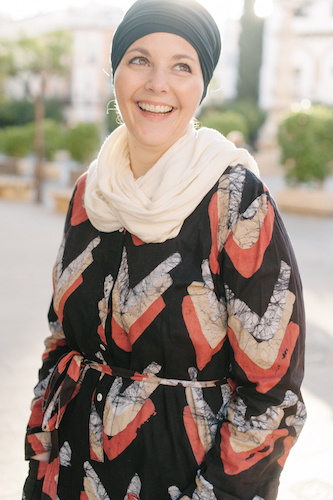 It was fun talking to Maria because I discovered a lot of the traditions, cooking ingredients, and techniques mirror life in Morocco. In fact they still have a community bread oven in Chania! I really wanted to visit and see it before I left but ran out of time. Just like in Morocco younger generations are foregoing traditional recipes and life and instead opting for foods that are fast and easy. This is taking its toll on the once revered Cretan farm to table diet – one of the healthiest in the world! When all of our food was done, we all sat at Maria’s table and ate our meal. It was so good and I am still remembering that night. Just like you would expect a family member to do, Maria packed up our leftovers and sent them home. We ate it all! The town of Chania is a mix of Byzantine Greek, Venetian, and Ottoman architecture and design. These three groups dominate and shape the history of the island. I heard really conflicting stories while we were there. George, our food tour guide told us that when the Ottomans’ took the city from the Venetians the population was really happy. The Venetians were strict overlords, requiring male citizens to preform labor for the state yearly. Some of the things they were tasked with included building walls and rowing in the galleys of Venetian ships – an especially loathed and dangerous task. This news from George backed up something else I knew about the Ottoman Empire, which was the Millet System that was a part of their rule. Under this system, which was set up for non-Muslim communities such as Armenians, Syrians, Greeks, Serbian Orthodox, and Jewish areas, the local religions and languages were permitted to handle most of their own personal affairs. For example, each had the legal right to use its own language, develop its own religious, cultural and educational institutions, collect taxes and maintain courts for trying members of the community – except for those cases involving public security and crime. However when it came to what my experiences with the Greek Orthodox religious community, their stories were much different. In one museum there was a showcase of the “secret school” where children were taught the faith. I don’t doubt this however, nearly everything I’ve learned or researched has said that Ottoman rulers allowed Christians and Jews to practice their faiths Scholars such as Bernard Lewis noted, life for dhimmis (Christians or Jews) living under Ottoman rule was “much easier than that of non-Christians or even of heretical Christians in medieval Europe.” The church was largely kept in tact and left alone, albeit under scrutiny, until the Greek War of Independence in 1821. This isn’t to say life was rainbows and butterflies. While dhimmis were given protection and largely allowed to live their lives as they wished, they also had to pay tribute and many non-Muslim boys were enslaved as janissaries, between the 1300-1600’s. I found these conflicting stories confusing. I know that under Islamic law people of other faiths were permitted to practice and pass on their religious beliefs. There are Christian and Jewish schools in Morocco and many other Muslim countries today. It just didn’t make sense. So I decided to do some research to see what the reality was. 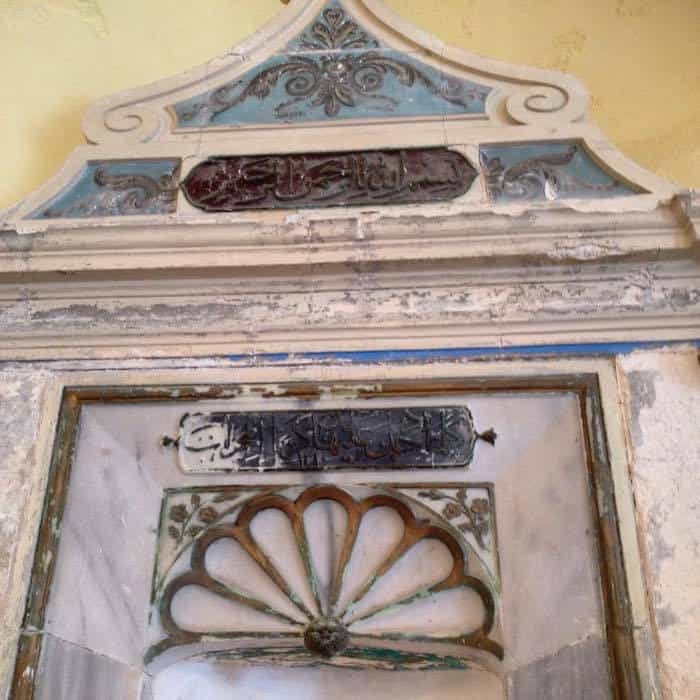 What I learned was that while some historical sites claim these secret schools existed, the story behind them is largely believed to be a myth. After the Greek War of Independence the first mention of a krifo scholio (secret school) emerged and the myth held on. The Mosque of the Janissaries is one of the large buildings in the port of Chania. It no longer operates as a mosque and is the oldest structure from the Ottoman period remaining. The story of janissaries is as interesting as Crete’s past. The Janissaries were enslaved non-Muslims (it’s not permissible to enslave a Muslim) at first they were those taken as political prisons or prisoners of war. Later the sultan’s men would comb the kingdom seeking out boys that showed promise. The boys were typically between six and fourteen, were taken from their homes and sent to live with Turkish families, learn the language and customs of Islam, and were under 24 hour supervision. But they weren’t normal slaves. Janissaries were subject to strict discipline, wore uniforms, were paid salaries and pensions on retirement and eventually formed their own social class. They were extremely good soldiers and were feared. I immediately identified this building as a mosque and was surprised to find Arabic inscriptions still on the outside. When I went inside, I saw it operated as a gift shop of sorts – that was kind of sad. But the niche was still in place. While everyone else was looking at things on racks, I was the crazy lady in the corner taking pictures of the niche. I wondered how many people knew they were standing in a mosque. There also is one other example of the Ottoman rule left. This church shows examples of all three major conquests. The building is Venetian, the minaret is Ottoman and the bell tower is Greek Orthodox. It’s the strangest looking church I’ve ever seen but I really could appreciate how they left it in tact to show the progression of history on the island. One of the saddest stories about this time I heard was about the Greek/Turk population exchange. In 1923 the governments of Greek and Turkey signed a decree that forced all Turks living in Greece to leave, and all Greeks in Turkey to do likewise. This amounted to nearly 2 million people forcibly made refugees. It was done under the auspices of protecting minorities after the Ottoman Empire collapsed. People who were ethnically Greek, who spoke Greek and had no roots in Turkey, but were of the Muslim faith were still made to leave Crete. Little weight was placed on ethnic identities, only religion. I wish that I would have had more time to explore the Jewish history of Crete. What I do know is that during World War II all but one Jew perished. The island suffered greatly under Nazi occupation had much of the island was destroyed. Like the Muslim population, there really aren’t any Jews remaining in Chania. I really did enjoy learning about the history of this island. For such a small landmass there are so many stories to tell!